This map generator has been completely redesigned to give increased usability and platform support. Thanks to Budda for the original program. Major features include: multi-threading, progress bar, import/export heightmap and biome images, biome and river painting, map markers, and tons of new inputs for creating varied maps. Try running the program from the console and giving Java more memory. Java version 8 64-bit is required. Nice - strange question, but what settings created that map in the screenshot above? Location: Independence, St Alphonso's Pancake Breakfast, (Where I stole the Margarine). Very nice, I especially like the tabbed layout, should fit just about any monitor and aspect ratio, all without input boxes getting squashed or pushed ofscreen. Which parts of it? I believe it was the defaults, and I just threw the map together for a screenshot. Thanks! The progress bar was what got me started on editing it, and I just couldn't help but fix up the layout. Added ability to place a marker on the map and see the world coordinates. Also a quick grid overlay I'll improve in the future. Edit: I just realized the isometric map view might be hard for this, so use the topo view to be more accurate. maybe add some boxes on the import tab to set size and max height and possibly not sure if other settings effect the import? 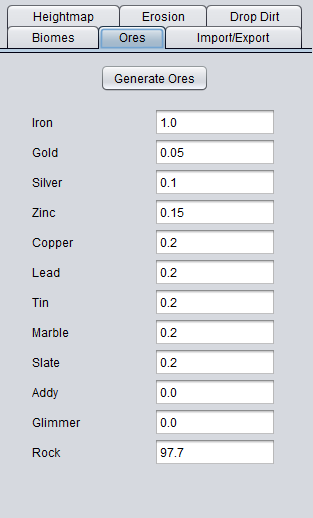 anyways i got a question would it be possible to setup something for biomes that is similar to ores in the sense of being able in 1 window to preset their sizes and amount and height and then just click 1 button to generate them all and undo and redo until you get one that you like and having it separate for trees and other biomes? Yes, this is the best generator so far. Puts all good stuff from the others in one place plus adds some improvements and user candy. Good job. Wow! Those are some really nice improvements to the program. Thanks so much for all the great additions! So nice finally knowing roughly how long it will take for the drop dirt! Currently I'm working on multi-threading the drop dirt function so that it is roughly 4x faster. It's almost complete and should be out today. I'll see what I can do about the UI improvements, and look into setting up separate biome settings for each tile type. 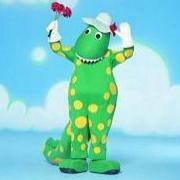 I'm putting everything on a todo list so it should get done eventually. I keep running out of memory at different times making a map so it is getting me frustrated. My java is set to have 6g's of ram and yes I have a 64bit machine and java. But your map gen just don't want to work with my pc what so ever with out having a memory issue some where along the lines of creating the map. Until you get this fixed I want risk my pc to damage. Looks nice but the memory issue that keeps poping up is just not worth my patients or my pc. 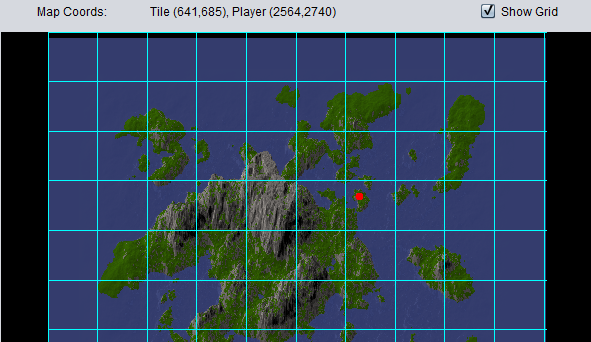 How big of maps are you guys trying to generate? It shouldn't have any problems up to 4096, which is plenty big for most private servers. Unless your computer just doesn't have enough RAM. If you need bigger maps, generate several smaller ones and connect them as neighbors. Added multi-threading to drop dirt (2-4x faster depending on your setup). Fixed map name save bug before you have a map. Moved import heightmap button to heightmap tab. Added grid size adjustment input (enter to submit). Hmmm multi threading sounds good and is very promising. But I think that problems with heap are genereted by java controlls not by a map itself. I use my own command line program to edit maps 4096 and over and have no memory issues. 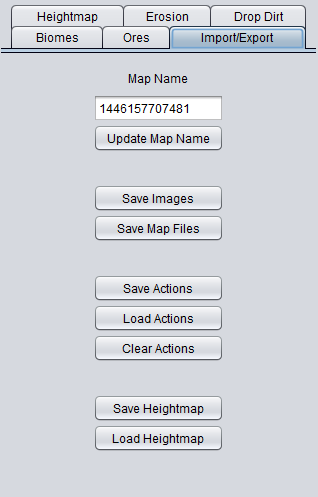 For most simple modifications my code uses only two map rows. Of course dropping dirt is much more complicated question. 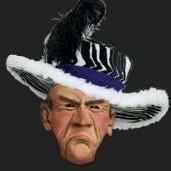 I stay tuned for more news. What would be wonderful would be some way to randomize the biome size. It's a bit annoying to generate the same biome multiple times just to get different sized patches of it. It could be an improvement for the biomes generation . Biome size is kind of random through growth. But it applies the same growth rate to each seed on the action. Biome size is basically the max it can grow (at 100% growth rate). I could probably make the growth random on each seed, so you could set a min and max growth, and hopefully keep it consistent with saving actions. 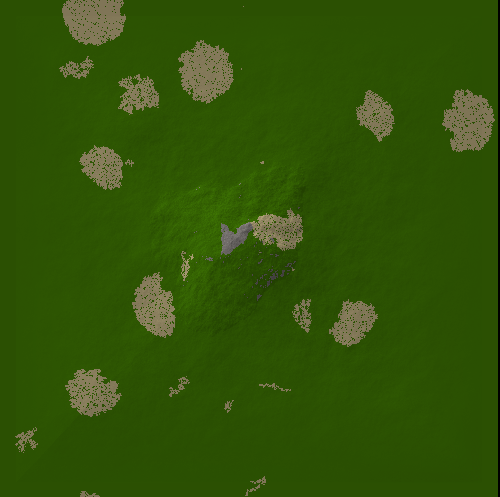 Right now when you generate a biome, all the patches are pretty much identical in size, if not shape, that's what is annoying about it. 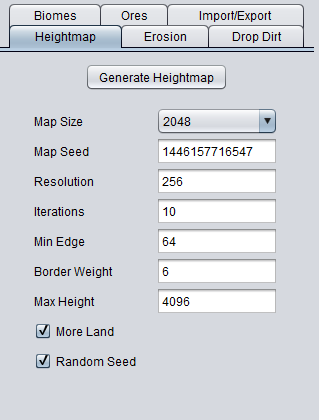 If making the growth random on each seed would result in several different sizes in each action, I think it would go a long way towards making it far better. My maps are 8192 and heights of 16384. Like I said before it don't always run out of memory it is random when your version does it. 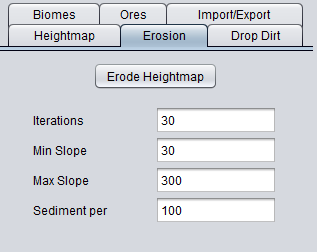 Some times it will happen on the Erosion process and some times it's the drop dirt process and other times it's random in the biome generator. I've yet been able to get to ore generator with out this happening. In budda's and Warlanders versions this hasn't happened to me not even when I do a 16384 X 16384 map. I have 16gigs of ddr3 in my machine every stick is in 100% working order and flawless. 6gigs was devoted to java programs and the rest left to windows. Some where something is lacking to see how much ram is there cause I've watched the processing as things where being done and the generator never reached 6gigs of ram yet it says it was out and closed. Is this version 32 bit java only? or is it 64bit as well? Added random growth rate to each seed in a batch (gives various sized biomes if using growth min/max). 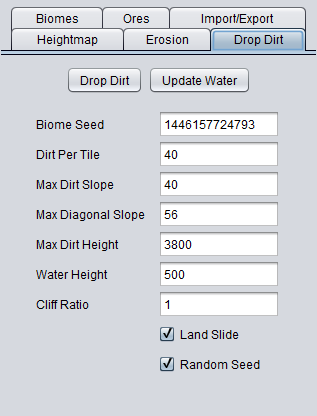 Fixed biome seeding so that all seeds grow a biome (instead of throwing away ones that don't match). 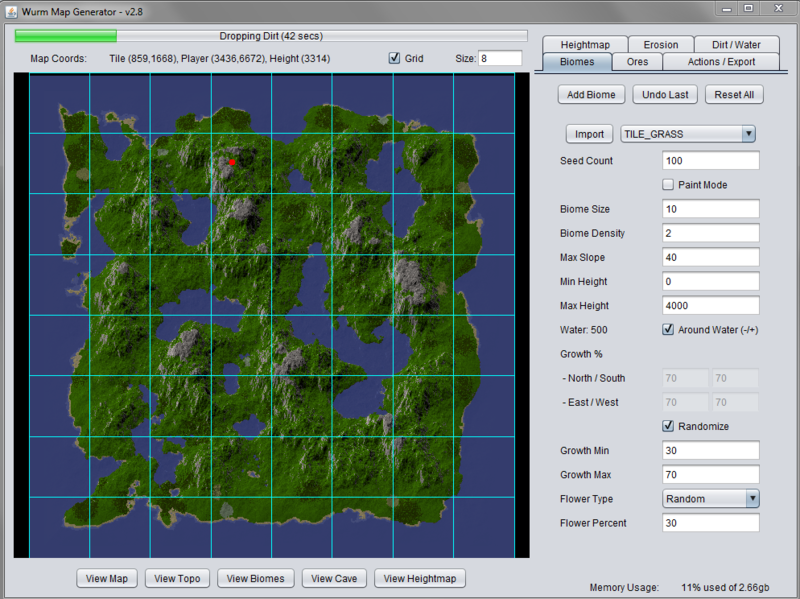 Added biome density input to create sparse growth (higher numbers = more spread out). Greatly improved error feedback mechanism. 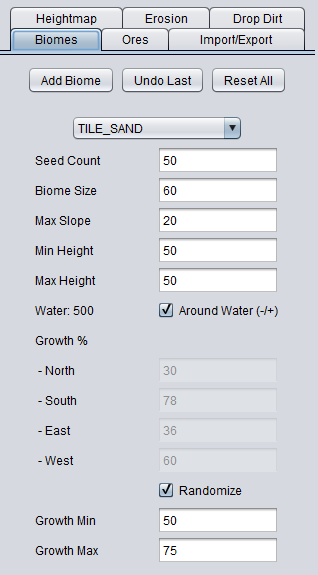 Is it possible to add the ability to manually add in Biomes at set coordinates with a set size and seed? I've successfully generated an 8192 after giving it 8gb for RAM (it never actually used that much). Generated heightmap, erode it, dropped dirt, biomes, and ores. Maybe try reducing the number of iterations on your actions and manually running them several times? I've updated the error reporting so that might help troubleshoot the issue. The underlying program that does all the generating is the same as Budda's because it was built off it. So if it works on his original one, it should work on this one.